Earn $5.40 in Rewards credit (540 points) What's This? The 11 speed revolution is available at a much more economical price with SRAM's Rival 22 Rear Derailleur. 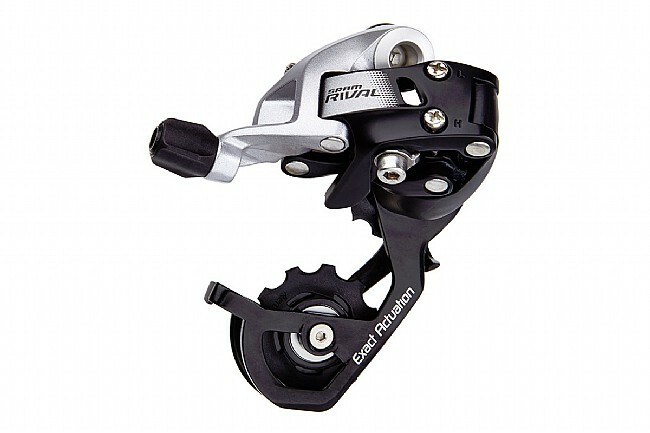 A prime example of SRAM's tendency to trickle down technology from their most expensive groups, the Rival 22 Rear Derailleur is now fully 11 speed compatible. AeroGlide Pulleys™ spin quiet and smooth for an excellent riding experience and Exact Actuation™ shifting is precise, easy to set up and consistent for miles and miles of use. With a short cage and medium (WiFLi) cage version available, it is easy to find the right fit for your bike, and with its attractive price tag, an 11 speed drivetrain is now within reach. The Rival 22 Rear Derailleur is available in short cage (180g; 28t cog max) or WiFLi medium cage (191g; 32t cog max) versions.